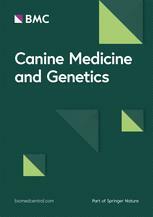 Canine Genetics and Epidemiology uniquely focusses on publishing research relating to all areas of genetics and epidemiological research in canids concerning health, disease, genetic testing, diversity, historical development and evolution. This open access journal disseminates findings widely not only between scientists, but also veterinarians, dog breeders and owners through lay summaries of articles. This provides high visibility to published research and its impact on dog breeds and canid species. The journal will not publish articles describing research generated through experimental procedures that inflict pain and suffering to animals.